Families within the default family set must contain unique subjects. It is not possible for a subject to belong to more than one family within the default family set. The above restriction does not apply to any user defined family sets. It is therefore recommended (although not compulsory) the default family set be reserved for siblings since siblings by definition belong to a single family. Additional family sets can be used for other miscellaneous groups such as teams where a subject can belong to several trams withing the one family set. Families can be created in a number of ways. Click the New family icon in the toolbar. The three methods above all create families in the currently selected set. 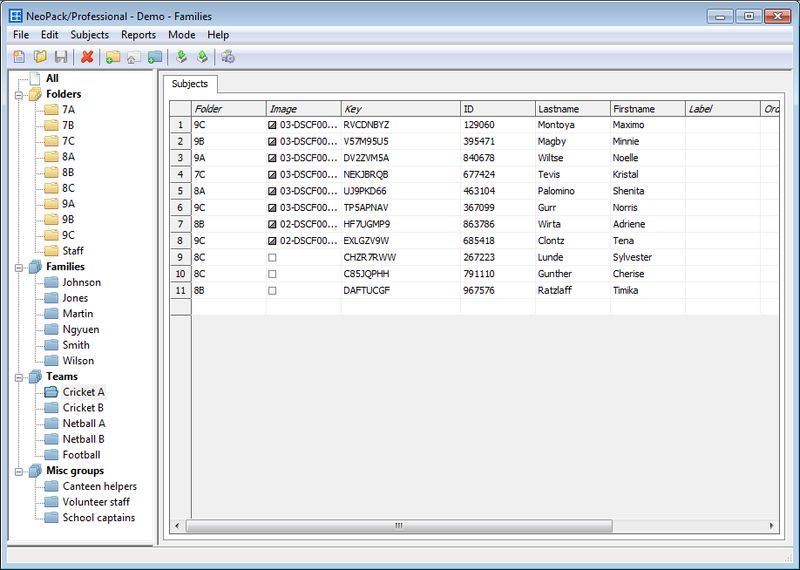 In the absence of additional family sets or if no set is selected the new family will be created in the default set. Once a family has been created it can be named and subjects added to it. Additonal methods for creating families involve selecting subjects first and creating the family in one step. Shift-click the new family icon. This will always create the new family in the default set and add the subjects to it. Drag the subjects to a family set. This will create a new family in the set and add the subjects to it. By default the new family will be named according to the subject(s) last name field. This may be modified as needed. Consider the following simple text file. It contains four families - Renshaw, Miles and two different Aitken families (It also contains a subject, Ian Holmes, that does not belong to a family). Note the inclusion of a 'family' field. This contains the name of the family to be created. Although it is possible to use any field to create families (notably the lastname field) this is not recommended since it cannot distinguish between different familes with the same lastname. The Aitken family in the above text file exemplifies this. Had the lastname field been used to create families the result would have been a single Aitken family with four subjects. Although this situation could later be remedied manually in Details Mode it can be avoided by using a dedicated Family field and giving each family a distinct family name. 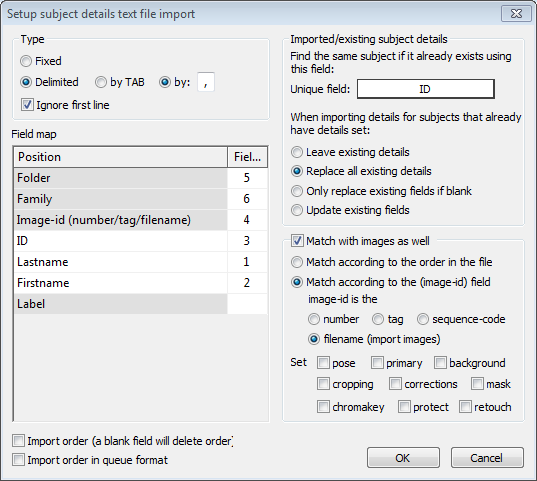 Creating families is then a simple matter of mapping the family field in the text file to the family field in the Setup window. The text file above would be mapped in the following manner. 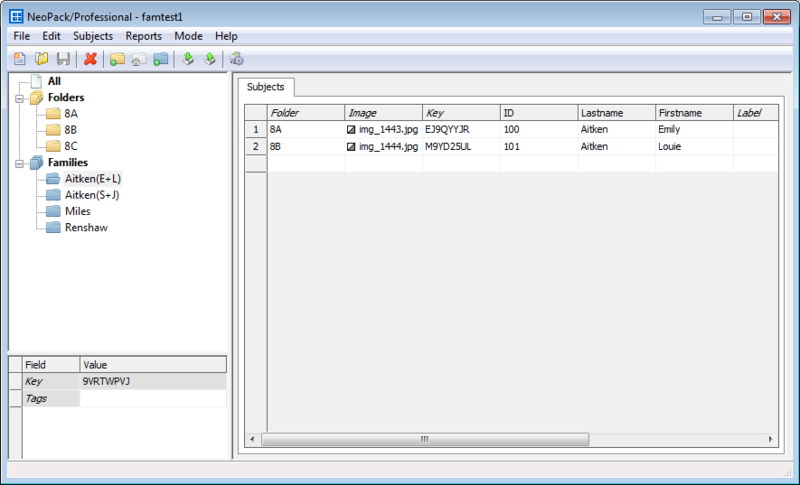 The result of importing the text file is shown in the following screen grab. Note the two different Aitken families. Figure 4: Families created by importing a text file.